The ice-core record shows a stabilisation of atmospheric CO2 in the 1940s, despite continued emissions from fossil fuel burning and land-use change (LUC). We use up-to-date reconstructions of the CO2 sources and sinks over the 20th century to evaluate whether these capture the CO2 plateau and to test the previously proposed hypothesis. Both strong terrestrial sink, possibly due to LUC not fully accounted for in the records, and enhanced oceanic uptake are necessary to explain this stall. Can mud (silt and clay) concentration be used to predict soil organic carbon content within seagrass ecosystems? We explored the relationship between organic carbon and mud (i.e. silt and clay) contents in seagrass ecosystems to address whether mud can be used to predict soil C content, thereby enabling robust scaling up exercises at a low cost as part of blue carbon stock assessments. We show that mud is not a universal proxy for blue carbon content in seagrass ecosystems, but it can be used to estimate soil Corg content when low biomass seagrass species (i.e. Zostera, Halodule and Halophila) are present. We address the imbalance between the supply and loss of organic carbon to the upper layer of the ocean by measuring a previously poorly quantified term: particle-associated microbial respiration of in situ particles. We find rates that are too low to account for the missing sink of carbon and suggest instead that zooplankton drive the transformation of large fast-sinking particles into slow-sinking and suspended particles. This apparent loss may help explain imbalances in the carbon budget. Phytoplankton spring bloom phenology was derived from a 15-year time series (2000–2014) of ship-of-opportunity chlorophyll a fluorescence observations in the Baltic Sea. Bloom peak concentrations have declined over the study period, while bloom duration has increased. It is concluded that nutrient reduction efforts led to decreasing bloom intensity, while changes in Baltic Sea environmental conditions associated with global change corresponded to a lengthening spring bloom period. Long-term nutrient fertilization and the carbon balance of permanent grassland: any evidence for sustainable intensification? This study demonstrates that intensively managed agricultural grasslands can sequester significant amounts of carbon in soils, especially under long-term applications of cattle slurries. There is also evidence that soil carbon sequestration can contribute to offset between 9 % and 25 % of total greenhouse gas emissions associated with the management of permanent grassland. However, to make livestock-based grassland systems more sustainable, further carbon-gain efficiencies are required. Previously identified positive feedbacks within the nitrogen cycle in the eastern tropical South Pacific (ETSP) have challenged our understanding of the observed dynamics and stability of the nitrogen inventory. We present a box model analysis of the biological and biogeochemical relations in the ETSP among nitrogen deposition, benthic denitrification and phosphate regeneration. Our results suggest dominant stabilizing feedbacks tending to keep a balanced nitrogen inventory in the ETSP. We extend the Community Land Model coupled with carbon and nitrogen (CLM-CN) decomposition cascade to include simple organic substrate turnover, fermentation, Fe(III) reduction, and methanogenesis reactions, and assess the efficacy of various temperature and pH response functions. Incorporating the Windermere Humic Aqueous Model (WHAM) describes the observed pH evolution. Fe reduction can increase pH toward neutral pH to facilitate methanogenesis. Wetlands are the largest global natural methane source. Peat-rich bogs and fens lying between 50°N and 70°N contribute 10–30% to this source. The predictive capability of the seasonal methane cycle can directly affect the estimation of global methane budget. We present multiscale methane seasonal emission by observations and modeling and find that the uncertainties in predicting the seasonal methane emissions are from the wetland extent, cold-season CH4 production and CH4 transport processes. Soil organic carbon can be used for climate reconstruction and carbon cycle study. This work assessed the effect of temperature on surface soil δ13C by an investigation from 27 sites across a temperature gradient along an isohyet. This study shows that soil type and vegetation type had influences on soil δ13C, while temperature was not related to soil δ13C. This suggests that organic carbon isotopes in sediments cannot be used for the paleotemperature reconstruction. 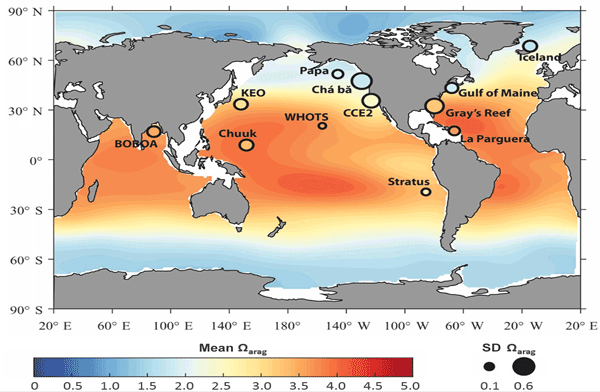 Ocean carbonate observations from surface buoys reveal that marine life is currently exposed to conditions outside preindustrial bounds at 12 study locations around the world. Seasonal conditions in the California Current Ecosystem and Gulf of Maine also exceed thresholds that may impact shellfish larvae. High-resolution observations place long-term change in the context of large natural variability: a necessary step to understand ocean acidification impacts under real-world conditions. In the context of the VAHINE mesocosm experiment in the Nouméa lagoon (New Caledonia), a 1-D vertical biogeochemical mechanistic model was used together with the in situ experiment to complement our comprehension of the planktonic ecosystem dynamics and the main biogeochemical carbon, nitrogen and phosphate fluxes. The model also showed the fate of fixed N2 by providing, over time, the proportion of diazotroph-derived nitrogen (DDN) in each compartment (mineral and organic) of the model.